I’ve recently applied for the Francesco Zonin‘s (Cantine Zonin is one of the greatest Wine companies here in Italy) new marketing initiative named Wine is Love (more on this on the linked Francesco’s blog, in Italian only) where some wine lovers bloggers are going to receive premieres bottles from the wine maker just to enjoy them. 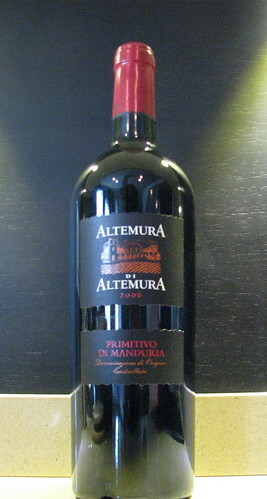 The first bottle I’ve received is a Primitivo di Manduria (note: the English version of this Wikipedia page does not exiest) produced by the Masseria Altemura (which is owned by the Zonin’s) and has layed a couple of months in my cellar waiting for the right chance to be opened. I’ve to say that I proposed to our friends on the upper floor to celebrate each of the bottles I’m going to receive with a special wine tasting dinner to give these wines the respect they deserve. For the Altemura di Altemura we arranged a full black suite table with demi-ballons glasses, black water glasses and design cutleries. The main course was a superbly coocked roasted guineafowl on a bed of spinaches and green beans. A bamboo cup of chinese rice boiled with garlic made the rest. We started the evening by reading the birth of this wine from the words of its creator (I’m gonna ask permission to Francesco Zonin to have this published) while the bottle sat opened on the table for more or less half an hour; we decided not to read the organolecptic table but to desume them by ourselves (we prepared a couple of “technical” booklets where to annotate our feelings about this wine and the dinner). The wine is plenty with strawberry and mixed berries, with a round corpus and well balanced tannines (I’m absolutely not a technician in this field and my English vocabulary is lacking too many wine related words to going deep into the description ); we thought it would have had a great benefit of another couple of years rest to reach complete perfection, but it was a marvellous wine indeed. Just a final note about the last sentence we wrote down: “Immediately order a couple of dozens of these bottles“. I wasn’t able to find any ecommerce on the Zonin’s site; Francesco: can you help? 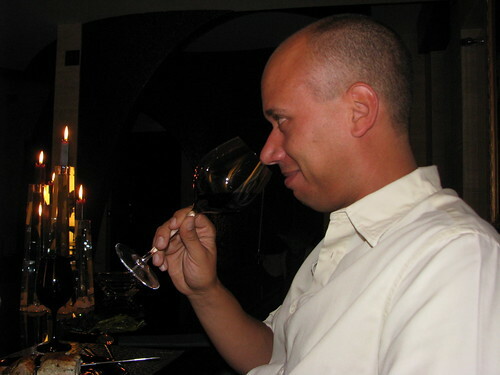 This entry was posted in Beef and tagged 2.0, life, marketing, personal, test, wine, wine is love, zonin by admin. Bookmark the permalink.